The translation in the Revised Version of the Hebrew "ẓefa'" and "ẓif'oni" (Isa. xi. 8, xiv. 29, lix. 5; Jer. viii. 17; Prov. xxiii. 32), for which the Authorized Version has "cockatrice." The Septuagint uses the word βασιλίσκον in Isa. lix. 5 for "ef'eh," and in Ps. xci. 13 for "peten." In all these places some variety of serpent is evidently meant, but the ancient versions do not indicate which. 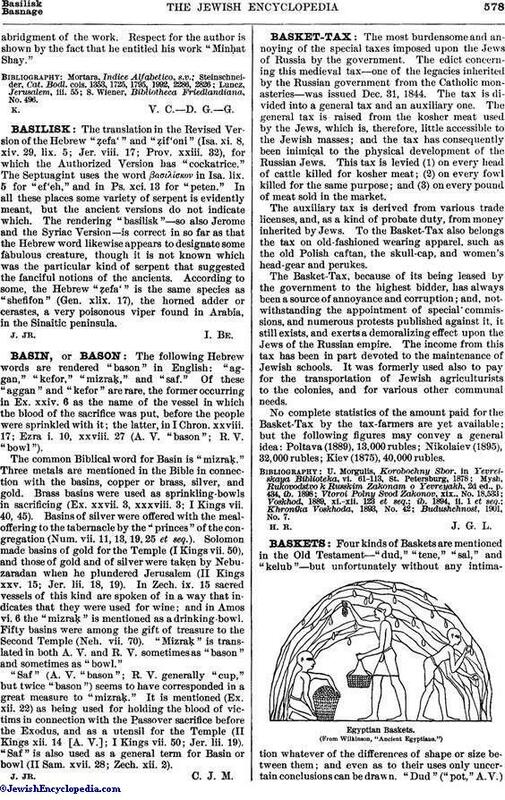 The rendering "basilisk"—so also Jerome and the Syriac Version—is correct in so far as that the Hebrew word likewise appears to designate some fabulous creature, though it is not known which was the particular kind of serpent that suggested the fanciful notions of the ancients. According to some, the Hebrew "ẓefa'" is the same species as "shefifon" (Gen. xlix. 17), the horned adder or cerastes, a very poisonous viper found in Arabia, in the Sinaitic peninsula.